The benefits of essential oils can be yours anytime, anywhere. These roll-on essential oil bottles are convenient travel companions that bring the pure essence of Young Living wherever you go. For the first time, every Young Living roll-on is available in our Complete Roll-On Collection. This collection includes the best on-the-go essential oil companions you can find. There’s a place for all seven roll-ons in your life! This item is so new, that you will need to click ORDER NOW, set up your account (I recommend Member to save 24% on all products. Membership options range from $45 for a Basic membership to Free membership when you start with a Premium Starter Kit). Just ADD Item 25649 to your membership! See below for tips! With a refreshing and rejuvenating aroma, the Young Living Breathe Again Roll-On is the perfect companion for early mornings, long days, and tough workouts. Breathe Again essential oil combines oils such as Peppermint, Myrtle, and Copaiba with four different types of eucalyptus—including Eucalyptus Blue grown on Young Living’s Ecuador farm—to create a powerful, invigorating experience. This rejuvenating blend, which includes the naturally occurring constituent eucalyptol, comes in a convenient roll-on applicator, so you can easily use it anytime, anywhere. Gives those sore muscles and joints relief! 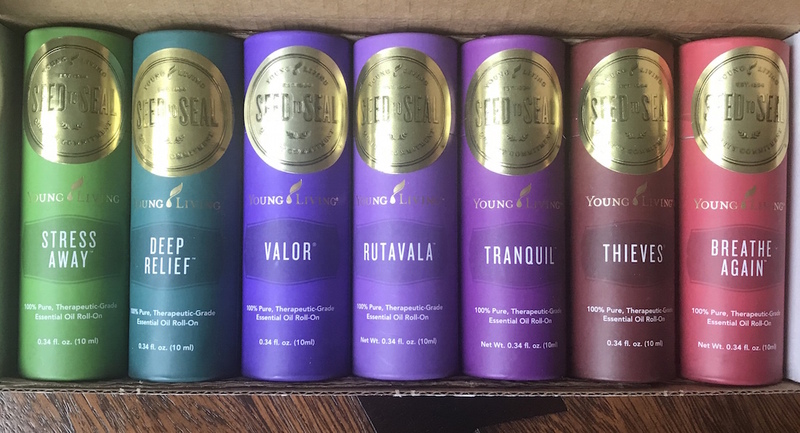 Youn Living Deep Relief™ Roll-On makes essential oils such as Peppermint, Wintergreen, Dorado Azul, and Helichrysum convenient for a fast-paced lifestyle. This blend of popular oils is a great companion for your trips to the gym and busy daily routine.Oils such as Peppermint and Wintergreen provide a refreshing, cooling sensation during or after a workout, with an invigorating scent that inspires an upbeat and energetic approach to whatever keeps you active. The convenient roll-on packaging makes this product an easy addition to your gym bag or purse so you can reach for it whenever you like. RutaVaLa annot be ordered separately. The distinct mix of Vanilla and Lime gives Stress Away its unique and pleasant aroma—among other benefits, including Vanilla’s naturally occurring eugenol. This blend also includes Copaiba, which has a history of beneficial properties; Lavender, with its refreshing and calming scent; and Cedarwood, which features the powerful plant constituent cedrol. All of these ingredients are expertly blended with the exotic scent of Ocotea, a unique, Ecuador-sourced essential oil. The Tranquil Roll-On applicator provides convenience and portability, and its proprietary essential oil combination offers a warm, slightly sweet fragrance. Just inhale deeply or roll onto your wrists to enjoy a moment of tranquility. The amazing winter wellness support blend. Great for rolling on the bottoms of feet before everyone heads to work and school for the day. Thieves® Roll-On comes prediluted and ready for application, so you’ll never leave the house without it! Stuck in an airplane with recycled cabin air? Working in a musty, old office space? Hosting a play date for your kiddies? Swipe on some Thieves and you’re good to go! You’ll adore its ability to purify the air, take advantage of its topical cleansing properties, and fall in love with its cozy and comforting aroma. Combining Clove, Cinnamon Bark, Lemon, Eucalyptus Radiata, and Rosemary essential oils, this roll-on gives you the assistance you need for any kind of day! Use it to greet each morning with a positive attitude or to refocus at the end of a challenging day. With the same empowering mix of Black Spruce, Blue Tansy, Camphor Wood, Geranium, and Frankincense essential oils, this supplementary product makes it easier for members to keep Valor with them wherever they go. 2. Choose a membership option to get 24% off wholesale pricing on everything. No strings attached. Basic Kits – $45 option to give you membership pricing without beginning with a starter kit above.